Breakfast at the Alpha was lovely. They had scrambled eggs, a variety of breads, including sweet -even chocolate. They also had a section of traditional German food - meats/sausage/cheese/breads and yogurt with museli. The tables were covered with white linens topped with pale yellow linen. The coffee was strong and came in little pots with small pitchers of milch. Our waitress was Vietnamese seemed very grateful for the tip we leave behind. The walk to DB was easy enough, but the stuff weighed us down...I pulled two roller bags with stuff attached and Mat pushed Kathy who is carrying a bag full of documentation, one full of meds, and one full of electronics. We found our Gleis (platform ) 13 and then waited for the train. The Germans are so organized they had a map of the cars on wall --- so that we could find our car number and stand next to it. Kathy bought first class tickets so that we would be comfortable on this long part of our journey ---The cars have an isle along the side and the compartments have six seats each with comfortable headrests. There are overhead baggage racks -- which are tilted upward so that the baggage will not shift and fall on your heads. As we travel southward the countryside is still very German. ..... the villages all have a center and a beautiful church spire. I wonder if the spires are indicative of denomination....We traveled through the alps down toward Innsbruck, Austria. The roofs of the houses look like Spanish tile --- but instead of half rounds they are patterned in rectangles. As we cross over into Italy several things are apparent The trains are less well maintained -- or perhaps they are just older. The buildings also look older perhaps less cared for. There is more graffiti. Perhaps we are in more industrial areas. The hillsides are dotted with little towns and there are the charming steeples ever present. Some of the towns have obvious ruins of castles in evidence. The further south we go the the more the steeples begin to have Romanesque qualities. We seem to be entering Trento from a part of town that is like what you would expect to find in a bus station in America, a homeless man was curled up on one of the benches and his belongings were in a shopping cart --but he was the first homeless person I have seen. Outside the station are many motorcycles, the most common means of transportation on these narrow roads. It has been raining fairly hard off and on. Each country seems to have a different system for waste. Italy also has people sort their waste in public places into cans, plastics and paper. Here instead of bins there are little donuts with plastic bags attached beneath. It has been overcast all day with no visible sun and still it is quite cool, I caught a cat nap and started one of Mat's fantasy books -- a series I had been thinking of reading for some time.....the Wheel of Time series. Most of the agriculture in Northern Italy is vineyards ---along terraced hillsides. There is no restaurant on the train -- apparently it broke down and they detached the dining car --- but no one told us that so it is lucky we had made sandwiches at breakfast and also we had fruit. Our traveling companions are a Korean businessman who attended a Solar symposium in Munich and was now taking some vacation and and Italian who said not one word but was texting. The Korean was very amiable and we had a good visit about his company. We arrived in Verona a city of beautiful rolling hills with the cypress trees pointing skyward. Magnificent old buildings...but we had to change trains in just 15 minutes so we began about five minutes before schlepping the bags to the exit of the train. We had a great Conductor who helped with the chair and then gave us directions on how to get to our platform.....THANK God the train we needed was just on the other side of the platform where we arrived. It was a Eurostar train --- which means luxurious and fast. Two Americans sat across the isle from us. They were an interesting pair. In their 50s or 60s..the man is wearing jeans, a fine Italian shirt -- He has his Bose earphones on and his wife has a 3 or 4 carat emerald wedding band surrounded by diamonds. They sit in single seats. Our seat mate from the train to Bologne -- fell backward against the man as he was trying to get his luggage down -- this guy is the kind of fellow who would give America a bad name-- He rolled his eyes and made negative comments. His wife suggested the guy was not out of line and this fellow was O.K. To which he responded that "He was clearly out of control" Later he made a bid as they were playing cards and when she didn't hear -- he spoke in a very intimidating manner to her. After a severe downpour we arrived late in Rome and took a cab to the Hotel De Vittorie not far from the Vatican. It was too late to do anything so we went next door to the little restuarant and had a wonderfully prepared Italian meal. We started with the Fresh mozzarella, cheese and basil salad, Then neopolitano spaghetti (it was a huge portion so mat ate at least half of mine. Matt and I shared a grilled Chicken Breast -- and Matt had the chocolate torte while I had a cup of co fee--- now off to bed and tomorrow we visit the Vatican and then on to the Cruise Ship! and fields of clover, yellow flowers, and still some lupine are beautifully visible. The little towns are spaced about every thirty miles, and the mountains are becoming less dramatic on either side of the valley. Trees are now mostly deciduous and divide fields where the cattle often lie down quite contentedly. I have seen no feed lots or any signs of giant agricultural operations. A cerulean blue stream moves swiftly along side the train now and again. The waters clearly come from the glaciers, and I have to wonder what will happen when the glaciers are all gone -- most of the rivers in this region seem to be filled with glacial melt. We were in 1st class on this trip, a space which we seem to have to ourselves. It is nice and roomy with very comfortable seats and space between them. This trip was non-stop and we arrived in Munich around 2:30. Since the train ended it run here we did not have to race to unload our luggage as we would have if the train had been moving on. Trains run on time in Northern Europe and there is little time for margin of error in arriving to catch one or even in getting your luggage off the train before it begins to move again! We walked along a long platform to the central station. This is the station I missed when I went on to Garmisch...on my own last Sunday. There are Starbucks, Burger King, McDonalds --- Burger King advertises a meal of hamburger, fires and coke for 2.99 Euro....which is really cheap. A brie sandwich (lettuce cheese and tomato on a really lovely dark bread was 4.95 Euro --- the healthy choice was considerably more expensive.) Beer, water and wine are all pretty much equal in cost. We arrived at our hotel Alpha Centre on Hirtenstrasse - just two blocks from the train station. At first they told us our reservation was cancelled, but on further investigation it is found, but they have not made provision for me at all....so Kathy winds up paying $55.00 more for the place AND we are in interesting rooms. They are pristine and very modern in some ways --but absolutely tiny --- there are two twins in one room --with a tiny refrigerator well stocked with booze -- a small closet a tiny t.v. --- rather like a small travel trailer might be in America. The bathroom is a step up --again very clean -- VERY small -- and there is a second step up into the shower of about 15 inches... it was also difficult to get up the lift -- to get to it we had to take our stuff up 15 steps --- before you get to the elevator which holds two people with two suitcases..
Our room is 294 but we are on the 5th floor --- of the hotel. After we deposit our stuff we hire a cab to take us to the Hoffbrau Haus (actually two cabs) --- it cost 11.90 plus two euros for each cab -- to get there -- The Hoffbrau Haus is a traditional beergarten -- There are rows and rows of wooden tables with benches and the ceiling is painted in ornate but primitive designs -- There is a bandstand where a German ompah band plays and Germans join in singing old German drinking songs...There are many Germans here dressed in native Bavarian costume -- After asking it appears that they wear these costumes out of pride -- to the Hoffbrau Haus and other places in Munich--as well --- they have not been paid or are part of the local color -- they apparently do it from pride. After we sat listening and watching the kitchen produce vast quantities of food and deliver them on platters to guests -- we saw many tankards of beer leave the place --- and realized that probably beer was a necessary ingredient to the singing that would soon be going on...We stayed to hear the band and singing --- a bit by the tine we left the floor was covered in spilt beer --- and the floor sticks to my feet --- as we walk out of the beergarten. We arrived back at the hotel and found that this one taxi which held us all and only charged 9.90 Euro -- we sat out on the back steps and visited. It is cool enough to keep my fleece jacket on so it doesn't feel like summer here -- the peonies and early spring flowers bloom --- everywhere. The taxi driver this morning said that they had hail and terrible winds just 15 kilometers from where we were....so I guess it has been unsettled here. I feel disconnected -- without knowing where to look for news or weather. Just sit right back and you'll hear a tale, a tale of a fateful trip. 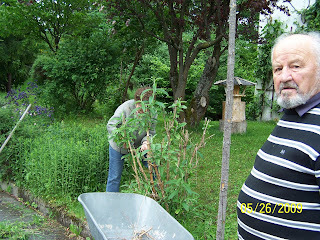 It started out at Garmisch stadt for a three country trip. We settled back in our seats totally unaware that the captain of this fateful bus was a yoddler with lots of hair. Snapping photos left and right at castles in the sky. Kathy and Bunny were in deep distress! Karen sat at the back of the bus blissfully unaware thinking of Lichetenstien and chocolate and eclairs. Well ---you get the idea we could go on and on -- but it was another wonderful day in which we saw Austria and Switzerland and gave away all our money in Lichtenstein -- where they "take any kind of cash --- Euros, Dollars, or Francs --- but whatever currency you give them they give you change in some other currency making it impossible to know if you got you change back-- Poor Bunny wanted the passport stamped and they charged her two Euros!! We realized quickly that they way to make money in Europe is to get someone to give you some land and then declare yourself a prince and your land a country! Maybe that is what Rick Perry -- Gov. of Texas is planning to do! We found that it was a beautiful 28 km across and 8 km wide. We saw many beautiful little villages which seem untouched by modernity -- except for the ubiquitous satellite dishes and cars. But they really have done a great job of keeping their heritage in tact despite the numerous tourists. Almost everyone had little garden plots probably no bigger than our school gardens in which were planted neat rows of lettuces and beans there are big rhubarb plants in the gardens and peas --- it is still quite cold here and the gardens are just going in. You can see little cold frames where people have started there plants early! The views as we climbed through the Alps were beyond spectacular. They were breathtaking. We also loved the mountain meadows with cattle on the hillsides. Apparently the cows can come up for a couple of months, and the goats are hartier....staying longer into the cold weather. Our tour guide described a shami goat that grows a long beard which is used to make a natural brush know as a shami.. These brushes cost upward of $400! I guess I won't be bringing that back home to Dean for Father's Day or his Birthday. The waters rushing down the mountain are white with limestone and are fed from the mountain streams. Often waterfalls cascade down perhaps as much as a thousand feed before joining the main river. We saw three different rivers today -The Inn river which goes past Innsbruck, the Rhine of course and the one nearest Garmisch which escapes me at the moment --- it starts with an "L"
Crazy Ludwig and Counting Swans! Cool again, and breezy this morning with no rain. The peak of Zugspitze is still shrouded in clouds. We have yet to see its summit even though we were there yesterday! We joined an early tour for the famous Neuschwanstein Castle. It is the most popular castle in Germany with as many as 6000 visitors daily. As with all tours you have to pay your dues and we stopped first at a tourist shop with the standard wood carving, lace, and cow bells. Next we pulled off the road at Wieskirche, ( church in the meadows). Located in the midst of a great alpine meadow in the middle of nowhere it is a most imposing structure which our guide assured us was the highest example existing of a rococo church. The story goes that in 1730, Father Magnus Straub and Friar Lukas Schweiger built a figure of Jesus for the Good Friday procession, using parts from other wooden figures, which they then covered in linen and painted. (they were too poor to have Jesus carved - the story reminded me of a Frankenstein Jesus). Apparently it was such a realistic representation of the suffering Jesus, that the congregation found it too moving and they stored it in an attic. It found its way to a farm, the "Wieshof." During evening prayers on June 14, 1738, its keeper noticed drops of water on Jesus' face, which she interpreted as tears. Following this miracle -- the place was built round it and it has become a pilgrimage spot. The journey here by bus led us past the turn for Oberamergau and Augsburg on the way to Neuschwanstein Castle. Older local people all have walking sticks that look like ski poles, back packs and hiking boots They are prepared.....The tourist buses line up in long rows and tourists crowd into the church and then cross over to eat fried breads of some kind and other Bavarian treats. After many photos especially of the empty Organ chamber -- I found a sign indicating that the church was resorting it organ --- so for my husband Dean --I contributed 5 Euros to that cause, climbed back onto the bus and we were on our way climbing toward our goal. The great Castle Neuschwanstein can be seen from miles away. It is easy to see why it is the most photographed castle. Built by Ludwig II (the crazy Bavarian king) in honor of his friend Richard Strauss and as a get-away, the castle was begun in the 1869. For the next 17 years it was worked on but even at the King's death it was not completed. It was not until 1969 that the first performance of Wagner took place in the performance hall. The castle was designed by a set designer -- not an architect. This was no surprising because Ludwig loved Opera and when he became king unexpectedly-- the first person he sought out was Richard Wagner -- whose operas he loved. They were operas that gloried in the tales of the Norse gods and goddesses. Across the valley stands a yellow castle which belonged to his father, Maximilian -- and in 1885 he had a telephone installed between the two castles. He only lived in his beloved Neuschwantstein for 172 days --- before he was to be committed. (being judged mentally incompetent. He was not doing his job governing and was spending the treasury on building castles for his entertainment.) On the way to the institution he asked to take a walk and was found the next day in a lake with his dead psychiatrist floating along-side. No one is sure if he killed himself or if he was killed by the government, but just 6 weeks after his death the castle opened as a museum so that the public could help pay the great cost of the structure. It was still very cool indeed, and I was thankful to borrow Cindy's nice wool sweater from Ireland! We arrived at Neuschwanstein as the sun was breaking through the clouds and took a bus up the steep slope at the base of the castle....but there was still a steep climb to the Maria Bridge from which you can photograph the castle---the bridge goes over a a gorge ---and you can look back at the castle or down at a beautiful waterfall. Then it was back to the trail --and more climbing. We arrived at the castle and immediately had to ascend 89 stairs --- then we were in the servants quarters. Which were quite nice for what they were --- with dark wood everywhere and cradles and beds, tables and candelabras in evidence everywhere. Next we climbed another 64 Stairs to the main quarters of the King. There is a waterclooset with running water and there is a little basin where he could wash up which featured running cold water. He had a chair for reading, a chair for writing, and a special little chapel just off his quarters-- Everything was covered with dark wood and carvings. The carvings in this chamber took 4 carvers 14 years to complete. It was during this time that we encountered two young visitors who were enthusiastically counting images of swans. After brief introductions --and showing them Westmeady we struck up quite a conversation. They were from Virginia, but were living for three years in Great Britain and they were attending British school rather than American school. There parents kindly allowed Westmeady to interview the girls to let boys and girls in on the experience of being an American child traveling in many countries. Their count was up to 82 when we entered the dining room next to the chamber, but all the rooms are dark the windows are small so they admit little light. For such a large building the castle has relatively few rooms finished. It seems like the perfect idea to finish the rest as guest rooms for a resort! But much of the castle was never completed. We climb down what seems like hundreds of stairs and then must walk down a steep hill to get to our destination for lunch and the return bus trip....I am nearly worn out just as we see a horse drawn buggy and hail a ride the rest of the way down. Our seat mates have an Australian shepherd with them and we immediately strike up a conversation. They do well with English and are training this dog to work their two horses. 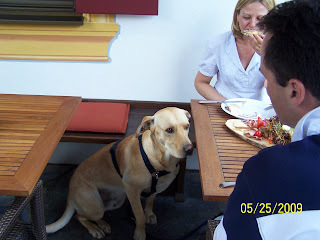 Murphy is very well behaved as all the dogs here seem to be as they join their masters for meals in the restaurants. (Often the owner provides a small bowl for his companion with water and the dogs receive treats for good behavior. We have lunch -- again trying more Bavarian cuisine -- this time I ordered the potato pancakes with applesauce and shared with Kathy who had a "meat-salat" various cabbages, corn, red beans, bibb lettuce, turkey on a skewer with pineapple - grilled in a vinegar dressing, and Bunny had a turkey sandwich on a wonderful piece of brott --- but the turkey was flavored a bit like the sausage here --- and to me tasted similar to a Bologna. Matt chose spaghetti and we all shared apple struedel and coffee for desert. The road winding back to the hotel criss-crosses and old trade route...the Via Claudia and we pass through the Austrian Alps before re-entering Germany and finding our way back to the Lodge. Oh, yes, the Swan count? Ultimately they had to estimate 2,220 total! We sang every show tune that we knew today to the entertainment of the bus on the way back from Oberamergau. Early morning found us boarding the gondola to the top of the tallest mountain in Germany. Bavaria is beautiful -- rather like Switzerland. Water pours down off the mountains in huge waterfalls and rushes past the roadway in great torrents that seem to have a high mineral content for it has a remarkable opacity and white color. It was cold today with the high reaching only to the upper 50s. As we rose into the clouds the sound of ice breaking from the cables and striking the gondola surprised us. There was snow everywhere and it felt very much like winter to me. We could see nothing of the four countries from the summit even though the light was blindingly bright. We got a cup of hot coffee and waited until we could catch the car on its return trip. There was a little restuarant at the top with lovely white table linnens --- we were the only people there. Most have probably been more prudent in assessing the value of the trip and have gone to other places. It rained and poured yesterday afternoon and this morning the cold and fog have been a deterrant to this tourist site! In each of these coffee houses there are elegant deserts which look very different from those we are accustomed to in America. They all involve pastry, layers of cream, layers of colorful transparent toppings with various exotic fruits embedded in them. And of course there is the Apple Struedel which is nothing like that which can be purchased at Kroeger. Kathy remained at the bottom of the lift --- and when we returned there was a great hill to ascend to the train which we rode back to Garmisch. The train ride down the mountain was beautiful. We passed meadows with sheep grazing and cows contentedly munching on grass to arrive in Garmisch and find our way to the bus station for the trip to Oberamergau. This quiant town is the home of the great passion play which occurs every ten years. It was performed as a part of a bargain with God in 1634 -- if God would spare their community the plague -- they would do the passion play once every decade! They have kept their word. The next play will occur in 2010, so everywhere there were men beginning to grow their hair and beards. The town was relatively uncrowded and we enjoyed a fine meal where we were the only people in the restuarant. Germans seem to love their sausage and pig is a big item on the menu along with potatoe dumplings! We walked among shops where there were the traditional tourist things -- but also felted slippers and things you would not find elsewhere. Beautiful hand carvings costing thousands of dollars were next to linnens that were nearly as beautiful. What I found most interesting was the gardens and I stopped and spoke with several folks who were gardening. Though English was an impediment they were willing to struggle to make themselves understood---and to understand me. One elderly couple especially had a beautiful garden of alpine flowers including edelwise....and also had familiar things like sedum and hens and chicks. They told me that many of the flowers were past their prime, but the garden was clearly lovely. I passed an elementary school and took pictures of a school garden similar to our own and was sad to see that the children had gone home for the day! We returned to Garmisch to the Edelwise Lodge, the military installation where we have been staying and enjoyed cheese, brot, local tomatoes, and fruits for our light dinner. After dinner there was much laughter as Bunny brought up two friends from my little school mascot, Westmeady the dragon --- We began filming them and laughed several times until we cried over the antics of these little entertaining creatures! I hope the school children find them equally entertaining. Tomorrow we visit Neuschwanstein Castle! We slept until we woke up -- I guess that means we are all alive! My friends were exhausted from their travels and the late hour that we retired last night. I was exhausted from having only cat naps for 30 hours. country fried potatoes and numerous other choices.... Then we were off to the village of Garmisch to see what we could see....but mostly to relax and to rest for the onslaught of sight seeing scheduled for tomorrow. The town was not crowded, and there were amazingly few cars. Our cabbie arrived in ledehosen and quickly loaded the two wheelchairs in the trunk while three of us squeezed into the back seat. I was the smallest of the three, and we know I am not small...but I squeezed myself into the smallest space I could and we got the doors closed. I burst into laughter when the first thing Kathy asked about was where we might find lunch! Yes --four fat ladies and all they want is lunch....tears ran down our checks as I recounted how that might have sounded to the fit cabbie in lederhosen. The picture above is our lunch (Kathy and I split this sizeable feast) which also came with red cabbage cooked in a sweet and sour sauce. The two round things are dumplings --- one is made of potatoe and had a gelatinous texture and the other is made of bread which was rather like an overly moist stuffing. 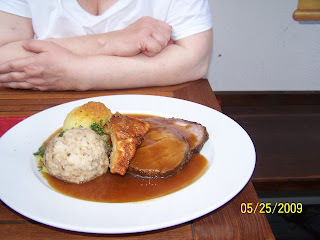 The pork was seasoned with something delicious which I didn't recognize and the crispy looking thing on top we surmised was deep fried pig fat. We watched as other guests were served interesting local cuisine... sausages of vast variety came in bowls of steaming hot water, sausages over sauerkraut which was somewhat milder than the American version -- but also had fat in it, a large ham hock with a good portion of leg attached -- rather like we would have a chicken drumstick was served to that man at the next table! AND there were dogs at dinner with their families! I asked why we can't have dogs in our restaurants at home. Kathy suggested that it wasn't sanitary. "Well they let the mice and roaches in." suggested Bunny. "Yes, and in Tennessee, I said, you can now take your guns into restaurants and bars." Somehow it seems more sensible to let the dogs in. In fact I suggested that every restaurant have a bull snake to keep the rats down and a gecko to eat the roaches! Again we were impressed with the friendliness and helpfulness of people who should have been grumpy and tired from all the stupid tourists....but we found only kindness from everyone. We did a bit of shopping and I got back into the wheelchair business as if I had never left it ..Maybe I will have sculpted pectoral muscles when I get home but I will have to stop eating the local faire! When everyone went out for dinner tonight....I stayed behind --- made some coffee and had cheese and apple --- my standard lunch at home --- only this cheese was fabulous --- obviously from the happy cows that we hear on the mountainsides (their cow bells ring out with delightful frequency). This was the second day of magnificent weather --- cool and sunny----clouding over in the afternoon and then pouring down in torrents -- I got very wet trying to find a green grocer where I could acquire some buttermilk. If you have never had the cheese, butter and buttermilk from this corner of the universe -- I can only say you have never really tasted these delicacies before! Tomorrow we begin our sightseeing with a trip up Germany's highest mountain, and a visit to Oberammergau. There was the opportunity to go to Dachau....but I don't think I could stand it. As I grow older my heart becomes ever more tender and such hideous atrocities are beyond my ability to maintain myself. Neuschwanstein castle is just an hour from Garmisch. This is the castle that Disney based Sleeping Beauty's castle on. I arrived in Garmisch at about 11:00 a.m. I was so pleased with myself...that I managed to find the Deutch Bahn (DB) in the airport, buy my ticket, board the train, change trains in Passing, and actually get here. But to say that I got here on my own would be a total falsehood! You see there was a lovly young man on the platform to help me choose the correct train. (They were both the same color and number but going in totally different directions) Then there was a young woman whom I asked the time of --to make sure I had not missed the stop in Passing. At each step of the journey a kind person has emerged to help -- at Passing I had only 5 minutes between the arrival of my train and the departure of the one to Garmisch. It of course left from a different platform (I arrived on Gleis 2 and had to get to Cleis 3) and there was construciton going on, but I managed to climb down the steep set of stairs at the station to find the stairs for platform 3 and began dragging my one heavy suitcase up the stairs. There are ingenious little conveyor belts alongside the stairs to help with this -- but it was out of commission. A man at least as old as I am grabbed my bag and carried it to the top of the stairs...then turned around and took two of his own to the bottom. He barely gave me a chance to call out Danke and he was gone -- a good samaritan indeed! Finally on the last leg of the journey a beautiful young woman who had taught in an American College in North Carolina for several years and had returned to get her PhD and was taking a new jog in Munich. Her mother sat accross from me and we had a great visit. She was an exchange student to the U.S. to (imagine this) Crossville, TN...so I wound up inviting her to visit us when she come back to the U.S. so that she can enjoy Nashville and its many attractions. When it was time for me to get off at Garmisch she even insisted on hefting my bag to the platform for me. During the last leg of the trip, I conscripted her help in getting the man who took the tickets to send information to the station where Kathy was to arrive --- to have her paged at the time of the trains arrival and let her know that I was safely waiting in the train station in Garmisch. It was funny to hear Noelle scold me for not letting her know where I was and that I was safe.....Dean, less critical but equally concerned --expressed similar frustration --- why had I not called? I guess the answer is ---I knew where I was!! But in today's world where we communicate via the internet with such ease --- it seems frightening when we are out of touch even for a day! Think of what it might have been like when your child departed on the Oregon trail -- and you might not know anything for months on end about you kin!!! Leaving on a plane is a little like dying! Whatever you got finished before you left is finished. Whatever you left unaccomplished is just that -- incomplete. Just as in death, you are boarding a ship for an unknown journey. You think you know your destination, but things could intervene. The destination might be different somehow than what you imagine --- it might be a surprise! As I boarded the plane (exhausted from putting the library to bed on Friday, packing until 1 or 2 a.m. Friday & Saturday, and tying to tie up all the loose ends before departure) I have a mix of anticipation and sadness. I am leaving behind the familiar, the comfortable, and the predictable. I am leaving behind my family and friends all my routines. But as I settle into my seat next to two German friends who have been vacationing on Longboat Key, Florida, a certain peace pervades my consciousness. I wonder why I can't extend this peace that things are now out of my hands and control is in the hands of others. In many ways this is the way of it. We cannot control our health, or a criminal's choice to rob or end another's life, or even our circumstances at work. The truth is we can only tack our sails depending on what life gives us. Yet, I know when I return to earth I will take all the of weight of responsibility and worry back as if I did control those things! Physicist Leo Szilard once announced to his friend Hans Bethe that he was thinking of keeping a diary "I don't intend to publish. I am merely going to record the facts for the information of God." "Don't you think God knows the facts?" Berte asked. "Yes, said Szilard, "He knows the facts, but he doesn't know this version of the facts." So it is that I will begin my "diary" of this trip so that the facts can be recorded from my perspective, in case God is curious! After dinner I note we are 1/3 of the way to Munich. There is a track of the plane superimposed on what appears to be a google map of the earth. We are just about to leave land and begin the transit of the Atlantic just South of Greenland. People settle in for the night and cabin noise becomes more hushed as the lights of the cabin are dimmed. Plenty of things to distract -- movies on the screen, music in the earphones, newspapers, magazines----just like at home --it is seldom that we see people living in the present moment. What would happen if we did live more intentionally in the present moment? I find my distraction in Bill Bryson's book "A Brief History of Nearly Everything" which provides a fascinating insight into science and scientists since the 18th century. His writing is a fast moving narrative providing tantalizing details about the lives of people whom we revere as giants. There are characters here which I have children's biographies for -- I am thinking next fall we might do some of these as Lunch Bunch Choices with the details added in this book which humanize the greats in humorous and eccentric ways! I fall asleep and sleep fitfully (it is cramped in steerage, and I know those in 1st class are stretched out on recliners with footies and every need tended! Dawn floods the space with rose light and we are nearing the end of our journey. Interesting details like the airspeed, temperature outside the cabin, altitude, tail wind were displayed between movies all night long. It was -70 F tail wind averaged 100 miles per hour, speed hovered at 690 mph. We have landed, and all confidence disappears! When is an aweful teacher wonderful? Jesse stood in front of the morning news camera reading his research on our Solar System. 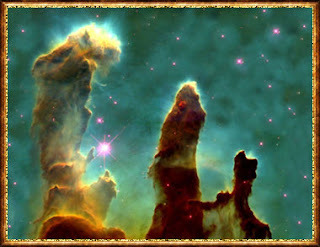 He had illustrated all of the planets and even some asteroids. Jesse is the kind of student every teacher dreams of. He has a fine mind which is coupled with a supportive family and enough personal discipline to insure that he can process the information he readily seeks out. He was on my mind that evening as I looked for colored sidewalk chalk for our Field Day. As I walked down the aisle of school supply store, I passed a display of plastic colorform planets designed to be placed on the wall of a classroom. I couldn't help myself.....I bought them planning to give them to Jesse. When I got back to school the next day, I realized I had another gift for him. I had purchased a telescope at the Goodwill store for only $5.00. A small refractor, it was far better than Galileo's scope. With it he should be able to see the four largest moons of Jupiter, the rings on Saturn, and fantastic close-ups or the moon's surface. His parents were at school for field day to receive these gifts with Jesse and all were happy at the joy of such small gifts. But the greatest gift was the one presented me when his mother said, "Do you know when he got interested in all this?" "No," I responded. "It was when you had that fellow come from the Astronomical Society." she said. I laughed out loud. You see, the very nice man who was an amateur astronomer, a NASA certified instructor, had been way over the heads of my students. I had been embarrassed because much of the material he presented and the questions he asked were beyond the reasoning capacity of early elementary students. The length of the presentation which went long frustrating the teachers in attendance. Here in front of me was a young mind that had been deeply affected by a presentation that I had written off. It is a great lesson. We cannot judge the influence of each day on our students. One small thing that we do may have a deep and lasting impact for good or ill. I pray that even on my worst days when I am at my most boring, a few seeds of that lesson will fall on fertile ground....like Jesse's. It is also a lesson of humility, to recognize that while good teaching is important, learning is often not about the quality of teaching. Often the quality of education depends on the desire of the learner. So in a day when "teacher quality" is considered the most important indicator of student achievement, perhaps we need to rethink the complexity and art of the learning interaction.